I was listening last night to the first two Colorblind James Experience albums, the first time in a long time. The songs really stand the test of time, particularly ‘Considering a Move to Memphis’ and ‘A Different Bob.’ They’re still quirky, amusing, endearing and strangely catchy. 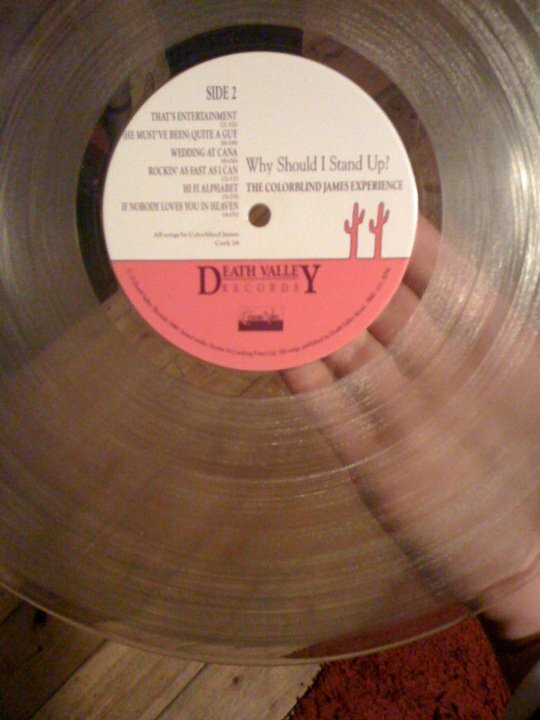 I’d completely forgotten, that my copy of the second album, ‘Why Should I Stand Up?’ is on clear vinyl! It still sounds pretty good and looks amazing, but very 1989. Back in the late 80s when the first album was released, there was an address in Rochester, NY and so I used it to write to Colorblind James (I had no idea what his real name was). I was amazed and delighted when he replied, not once, but twice answering my questions. I later found out the man behind the monicker was Chuck Cuminale who sadly died in 2001, but there are a number of websites which show just how well-regarded he still is nearly a decade after his death. This one is maintained by one of the band members. And if you haven’t a clue what I’m on about, have a listen to some of the songs on myspace. Thanks. Much appreciated. I’ll follow that link.